For Jesuit paleontologist and visionary Teilhard de Chardin, the Omega point is the time-space in which psychospiritual and cultural evolution are consummated. Noogenesis is the evolution of a global membrane of consciousness connecting all human beings collectively responsible for the future direction of the evolving culture, science, and religion of an embodied spirituality. Teilhard’s view concerning the ultimate destination of noogenesis regards the reducibility of psyche or mind to purely material processes in the brain and the entropy of a final death and disintegration of the noosphere as potentially fatal to the achievement of the final unity of matter and consciousness that he referred to as the Omega point. Accordingly, Teilhard rejects the Marxist ideology in which the individual is subsumed into the whole social system. In The Future of Man he wrote, “A world culminating in the Impersonal can bring us neither the warmth of attraction nor the hope of irreversibility (immortality) without which individual egotism will always have the last word” (1964:287). In a world characterized by an ever expanding secular materialism and neo-atheism with science itself constructed on an epistemological foundation of dogmatic physicalism (materialism,) Teilhard’s mystical vision of unanimisation on earth would never be fulfilled. The doctrine of physicalism has eliminated psyche from the traditional scientific understanding of cosmology and evolution including that of humankind. In our species the universe has evolved reflective consciousness as the mirror in which its very existence is revealed in the form of mathematical laws. According to the physicalist dogma about nature mental states and consciousness itself are regarded as causally inefficacious, epiphenomenal, or illusory by-products of neural processes. Hence, concepts of extended mind or non-local consciousness are ruled out of existence in a classical, mechanistic, scientific worldview, as are any theological or metaphysical notions of reality. Perhaps there is naivety implicit in the notion of one-to-one neural correlates providing a sufficient explanation of complex mental processes and symbolic consciousness as an emergent evolutionary reality without which science itself would never have come into being. In fact reductionist physicalism (materialism) is itself a metaphysical doctrine about what nature must be rather than being an explanation of it. This is ideology masquerading as science. As Atmanspacher (2014: 246) has pointed out, “The lack of success of physicalist approaches to one of the deepest questions in the history of humankind, the nature of mind-matter correlations, entails the search for alternative approaches”. Perhaps the most compelling alternative to physicalism which permits scientific research into mental and numinous aspects of reality is dual-aspect monism with its roots in the philosophies of Spinoza and Whitehead. Dual-aspect monism regards mind and matter as two basic and irreducible aspects of an underlying neutral domain. 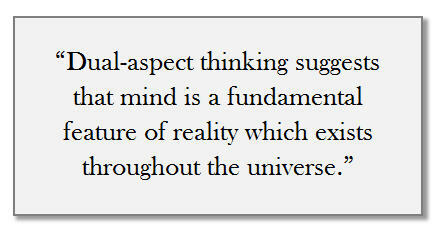 So that mind is as much a fundamental dimension of reality as matter. Only if the mental is as much a fundamental feature of the universe as matter can theology be redeemed from its excommunication by the dogma of physicalism which seems to be the “religion” of the neo-atheism of Richard Dawkins and his apostles. Physicist Wolfgang Pauli and psychiatrist Carl Gustav Jung both played a key role in the foundation of depth psychology and they collaborated between 1932 and 1958. Pauli wanted to enrich Jung’s archetypal psychology with insights from quantum physics in a shared search for a worldview more compatible with the evolving body of scientific knowledge than what philosophers had already proposed. In particular, both Jung and Pauli believed that the 400 year schism between science and religion needed to be healed. To that end the materialist philosophy of mind proposed by Bertrand Russell, his pupil Ludwig Wittgenstein and other positivist thinkers, including the once elite Vienna Circle of philosophers, needed to be replaced with a dual-aspect position in which mind was as much a fundamental dimension of reality as matter. Thus restoring a lost wholeness to human understanding of the evolving cosmos. (Todd:2016). The restoration of psyche would have profound implications for a panentheistic theology such as that of Teilhard de Chardin whose work was influenced by the philosophy of Baruch de Spinoza and the process philosophy of Whitehead. As Atmanspacher has put it, “In dual-aspect monism according to Jung and Pauli, from the mental, the neutral reality is approached via Jung’s collective unconscious while from the material it is approached via quantum non-locality” (Atmanspacher, 2014: 253). This is itself an example of the complementarity of mind and matter expressed in the terms “collective unconscious” and “quantum non-locality”. Physicist David Bohm formulated a dual-aspect notion of the mind and matter relationship almost synchronously with the proposal being developed by Jung and Pauli. According to Bohm, mental and physical states emerge by explication or unfoldment from an undivided, holistic, implicate enfolded order. Bohm referred to this as the holomovement because it is not static but rather dynamic as in Whitehead’s process philosophy. Atmanspacher notes the implication “that Bohm’s dual aspect monism is not only holistic as in the Jung-Pauli formulation, it is also fundamentally based on process rather than substance” (2014:256). P sychophysical correlations are determined by what Bohm refers to as active information which acts as a link or bridge between mind and matter as two inseparable aspects of reality. By bringing “the implicate into form” Bohm’s active information is analogous to the cosmic, archetypal ordering and regulating principles in the Jung-Pauli variant of dual-aspect monism. “Dual-aspect thinking suggests that mind is a fundamental feature of reality which exists throughout the universe” (P.258). According to Bohm and his colleagues Hiley and Pylkkänen, even the quantum level can be thought to have via active information a primitive mind-like quality although it obviously has no consciousness. The paradigm shift from a physicalist to a dual aspect monist perspective on the psychophysical problem and ontology has profound implications for a panentheistic theology like that of Teilhard. “with quantum physics the whole scheme of philosophical atomism is challenged and one is forced to consider some radically holistic basic principles. In the context of the implicate order, mind and matter are analogous to non-locally connected (entangled) quantum systems”. They ought to be seen as correlated projections from a common ontological multidimensional ground rather than as separate substances in causal interaction” (2014:87). Bohm postulated human participation in “a greater collective mind, in principle capable of going indefinitely beyond the human species as a whole” (2002: 386). By bringing the implicate into form, Bohm’s active information is very much in accordance with the cosmic archetypal ordering principles in the Jung-Pauli system with its collective unconscious and quantum non-locality. The mental and the material are generated by decomposition of an unfragmented whole, the unus mundus or one world (Atmanspacher, 2014: 252). Furthermore, “Metaphysics taken seriously in the sense of Pauli and Jung refers to a kind of reality more substantial, more material as it were than everything that physics and psychology would characterize as real.” This form of extra-physical (metaphysical) reality was designated by a mode of cognition expressed through abstract symbols. Such a notion contrasts with the idea of metaphysical concepts as disreputable and to be passed over in silence because they were devoid of any empirical scientific status in a classical, physicalist, mechanistic view of science ( Atmanspacher: 2011, 9. 3-4). The Incarnation of God is characterised by conscious participation in the future of evolution. One manifesting a mind and cosmic order transcending humanity collectively and contingent upon a global sense of identification with the species. This would entail a holistic vision, itself “mystical” of the interconnectedness of all beings resulting in a spiritual awakening whereby lost wholeness and sacredness are restored to the earth. So that the hymn of the universe can become a triumphant Te Deum rather than a requiem. If nothing is sacred, nothing matters. Regarding the origins of the implicate order, David Bohm’s colleague, theoretical physicist Basil Hiley (He received the Majorana Prize “Best person in physics” in 2012) has commented in an interview with Taher Gozel (2010), “mathematics is not about material processes unfolding in space and time. Mathematics is about thought, not the content of thought but the form in which we can hold the content of thought which is about becoming not being. This is where the implicate order came from”. The analogy with the Jung-Pauli notion of the archetypes as cosmic ordering and regulating principles represented in the internal phenomenal world and in the mathematical laws of nature seems to be particularly striking. According to Atmanspacher it is natural for dual-aspect monists to nurture metaphysical conceptions of the underlying domain. He points out that “there is a long tradition of interpreting Spinoza as a panentheist where God is immanent in nature but not identical with it” (2014, p284). Unlike pantheism, panentheism posits that God is immanent in nature and transcending of it, so that the universe and the divine are not ontologically equivalent. These ideas would suggest a paradigm shift in both science and religion while helping to heal the schism which has existed for 400 years. 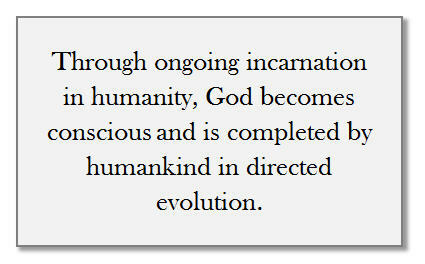 Through ongoing incarnation in humanity, God becomes conscious and is completed by humankind in directed evolution. Like the fourteenth century mystic Meister Eckhart, Jung believed in a continuing incarnational process rather than a singular historical event. (Answer to Job, 1958: 155) The incarnation is part of evolution and a continuing process as the term “divine paradigm” implies. (Todd, 2013:66) These notions would imply a panentheistic theology replacing the archaic concept of an anthropomorphic and interventionist God rendered superfluous by Newton and Darwin. In conclusion, these reflections on mind as active information and archetypes as cosmic ordering and regulating principles not only represent a position different from the religion of metaphysical materialism. They also refute the argument that God is a delusion as proposed by Richard Dawkins and the Neo-atheists. God and humanity are in a metaphorical entangled state so that the individuation or evolution of both cannot be separated and are dependent upon one another for completion. Humanity not only participates in a numinous dimension but also in co-creative divinization by directing the future of the noosphere and the biosphere culminating in an Omega point or divine focus of mind. (Todd, 2013; 2016). One in which science and religion are integrated and co-exist in a relationship of complementarity. Atmanspacher, H. (2011) Editorial, Mind & Matter, 9(1) 1-22. Atmanspacher, H. (2012) Dual- Aspect Monism a la Pauli and Jung. Journal of Consciousness Studies, 19 (9-10). Atmanspacher, H. (2014) 20th Century Variants of Dual-Aspect Thinking. Mind & Matter, 12(2) 245-288. Bohm, D, (2002) The Undivided Universe, London, Routledge. Bohm, D, (1980) Wholeness and The Implicate Order, London, Routledge. Hiley, B.J. (2010) Wholistic Quantum Model of David Bohm, Interview with Taher Gozel, Part 11. Available here. Jung, C.G. (1940) Psychology and Religion in CW, vol. 11, London, Routledge & Kegan Paul 1958. Pylkkänen, P. (2014) Can Quantum Analogies Help Us to Understand the Process of Thought? Mind & Matter, 12 (1) 61-91. Teilhard de Chardin, P. (1959) The Phenomenon of Man. New York, Harper. Todd, P.B. (2012). The Individuation of God: Integrating Science and Religion. Chiron Publications, Wilmette, Illinois. Todd, P.B. (2013). Teilhard and Other Modern Thinkers on Evolution, Mind and Matter, Teilhard studies, 66. Todd, P,B. (2016). A Copernican Revolution in Science and Religion: The Entangled State of God and Humanity. Conference Paper presented to the C.G. Jung Society of Melbourne, May 21. ResearchGate. Available here. Von Meyenn, K. (2011). Dreams and Fantasies of a Quantum Physicist. Mind & Matter 9(1): 9-35. Science has traditionally reduced reality to only what is “physical/material”, a concept which is called “physicalism.” In such perspectives there is no room for “consciousness” or love (as Teilhard describes it) as the physical structure of reality. Peter suggests that “dual aspect monism” presents a compelling alternative to “physicalism”: “…dual aspect monism regards mind and matter as irreducible aspects of a neutral domain.” In other words, as Teilhard says, matter and spirit are two faces of the same cosmic reality. Exploring the ways in which “dual aspect monism” is evident in quantum physics, Peter quotes Paavo Pylkkänen (2014: 86-87), “with quantum physics the whole scheme of philosophical atomism is challenged and one is forced to consider some radically holistic basic principles. In the context of the implicate order, mind and matter are analogous to non-locally connected (entangled) quantum systems”. In other words: quantum physics is further challenging how we have traditionally broken off the “mind” (or consciousness) as not belonging to or impacting material reality. Peter concludes by demonstrating the theological understanding of “dual aspect monism”: The Incarnation. Peter points out that the incarnation of God is continually happening, and characterized by conscious participation in the future of evolution. Peter’s blog introduces us to some very scientific terms such as “dual aspect monism”. How does this idea, that matter and spirit are actually part of one another, impact you? Have you considered how our spirit/mind might be creating or impacting the physical world? Peter introduces the quantum physics concept of “quantum entanglement,” an experiment in which two non-localized particles were found to be connected and effected one another, therefore the quantum particle can’t be thought of as independent but rather the quantum state is described for the system as a whole. If science is telling us that reality is physically interconnected, and can’t be broken down into isolated individuals…how might that impact how you see yourself? How might that change your notion of your identity? The theological correlate to “dual aspect monism” for Peter is the “continual Incarnation,” in which our participation in evolution is understood as the ongoing incarnation of God. How does thinking of your choices as part of the incarnation impact how you view your life? Peter, thank you for sharing your fine mind in this blog. I was challenged especially with the “new to me” vocabulary, but as I struggled, I realized that the five years of retreats with Ilia, Jack Haught, Ursula King and Kathleen Duffy have strengthened my intuition as well as my understanding. I “knew” in a deep sense that I was drawn by your insights despite not having a clear understanding of your words. I know it is “right” in terms of the path we are on moving forward. The Incarnation of God is deeply meaningful to me, and helps me to live more lovingly. I’m uncertain how to integrate Jesus into all this new understanding of incarnation, but I will stay connected to the Omega Project and read on! With gratitude. Gail, I was touched by your generous and insightful comment on my posting. Clearly you have been profoundly moved by the retreats with Ilia Delio and John Haught as well as by the thought of Teilhard de Chardin to whom the Omega Center website is dedicated. I believe that God is immanent in nature though transcendent of it so that the divine and the universe are not ontologically equivalent. This is a form of panentheistic theolgy. Apropos Jesus, I agree with Teilhard that, “the mystic Christ has not yet reached the peak of his growth and that it is in the continuing of this engendering that there lies the ultimate driving force of all creative activity …. Christ is the fulfillment even of the natural evolution of beings” (The Future of Man, 1964:305). The historic Jesus seems to me to be an epiphany to humanity of the divinity implicate in cosmology and evolution and hence of a continuing incarnation. Like Ilia, I therefore perceive Christ as an emergent phenomenon in the evolution of consciousness and of humanity collectively as well as God. Thank you, Peter, for this deeply stimulating analysis of our current religious situation, vis the relationship between religion and science. I have found your synthesis of Bohn’s active information, Jung-Pauli’s archetypes as cosmic ordering principles, and Bohr’s complementarity to be immensely rich and stimulating for reflection. How desperately we need a bridge between mind and matter. Your reflection encourages me to consider more deeply the ‘mechanism’ and the implications of dual aspect monism. Though it seems that as things presently stand ‘the demise of dogmatic physicalism’ is more of a prophetic claim – just as within the churches the interventionist deity still reigns supreme over a static three-decker cosmos – I am grateful for the voices of the prophets to whom you have introduced me in your reflections, including your own. Peter, I want to thank you for this post. As a physicist and a catholic, I have been struggling with how to understand the incarnation. Your post and your response to Gail have given me a new way to look at things. I am also grateful to the Omega Center as a whole for offering these blog posts. I hope to learn more. I have a question, how do these ideas change the way we practice our religion? For instance how do they change how we understand the mass? Many thanks for your illuminating blog. Over the years, increasingly I have found the meaning of the incarnation to be perplexing as it is mystical. Your current post and your book publication have assisted me in gaining a deeper understanding of the evolving interplay between religion and science and the relationship of the spiritual and the physical. Your succinct explanation of the variants of dual-aspect Monism, Pauli’s exemplars and Bohr’s conjugate pairs have provided me with a cradle for comprehending the mind as part of our cosmic reality. I hope I can continue to grow in my understanding of the ongoing, evolving incarnation and its natural evolution with humanity. Thank you, Peter. “Perhaps the most compelling alternative to physicalism which permits scientific research into mental and numinous aspects of reality is dual-aspect monism with its roots in the philosophies of Spinoza and Whitehead. Dual-aspect monism regards mind and matter as two basic and irreducible aspects of an underlying neutral domain. So that mind is as much a fundamental dimension of reality as matter”. Peter, this statement is so profound! It reinstates Mind as being as much a fundamental feature of reality as is matter itself. . As Peter comments, dogmatic physicalism is a doctrine about what nature must be rather than being an explanation of it. So that it functions as a secular form of religion which forbids propositions about Mind as a fundamental dimension of the cosmos. Peter regards this as ideology masquerading as science.The reinstatement of mind as a fundamental feature of reality sheds light onto the nature of the mind-matter relationship while potentially reconciling science and religion. As I understand his commentary, Peter adopts a panentheistic concept of God immanent in nature though transcending of it with his epistemology of dual-aspect monism. I found these ideas very helpful in clarifying my ideas about the Numinous evolving with nature and humanity rather than being external to a static pre-Copernican universe and intervening in it. The neo-atheists are killing off a concept of God which had become superfluous with the physics of Newton! I am very interested in this topic. So I think maybe you might also be interested in my research about a hidden pattern in human evolution that reveals the essential non-duality of energy and consciousness in the universe. I dare to send you the article “Beyond Darwin”, a resume of this research of more than 36 years. You can find it in byebyedarwin.blogspot.com, with Spanish and English versions, and optional pdf in both languages. This work discovers, with surprising accuracy, a hidden spiral-fractal pattern in evolutionary dynamics, that leads to a point of singularity —Omega— after two centuries. I’m sure that, if you read it, you’ll be surprised by its results.